Need somewhere to store all your puppy's toys? Look no further! Our luxury puppy toy bags are all handmade to order for us and they can even be personalised with your puppy's name so there will be no confusion as to who's toys are who's! These puppy toy bags have a drawstring closure and they are perfect for storing everything your puppy needs for a sleepover at a friends. Keep all your puppy’s toys neatly stored away in a stylish personalised puppy toy bag. 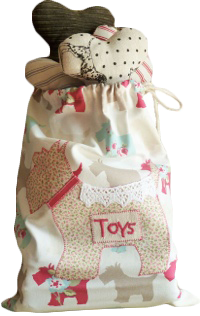 Our toy sacks are also ideal for packing all your puppy’s essentials when going for a sleepover. Choose from some great fabrics and even have your puppy’s name embroidered on the toy bag so you don’t forget who’s toys are who’s!